April 29, 2018, Victoria, BC – The Bantam Premier Victoria Eagles used some high drama to come away with 4-3 and 6-5 wins over the North Shore Twins in BC Bantam Premier League action Sunday afternoon in Victoria. In game one action, the Eagles used a walk-off single from Tyrus Hall in the bottom of the eighth inning to secure the game one win and then used a lead off home run from Tyler Burton in game two, to spark themselves to an eventual 6-5 win over the Twins. The two wins improve the Eagles record to 3-3 and leaves them just 3.5 games back of the Parksville Royals who lead the Bantam PBL circuit with a 6-1 record. In game one Sunday, the Eagles jumped into a 2-0 lead after four, but a three run sixth from the Twins, all scored off of Eagle’s reliever Hall, who replaced starter Jacob Popadynek, put the Twins in a position to win. However in the bottom the seventh, Liam Erlic was hit by a pitch and then came around to score on a double by Dominic Biello to tie the game. After Hall and reliever Owen Luchies kept the Twins off the board in the top of the eighth, Brandon LeBlanc doubled, was moved to third on a sacrifice bunt from Dave Jung and then came in to score the winner when Hall slapped a single past the drawn-in infield, sending the Eagles on to the field in celebration of the walk-off win. In game two, after the Twins opened the scoring in the top of the first, Burton would knot the game 1-1 with his lead-off home run. The Eagles would build on that momentum to hold a 5-2 lead after five innings of play, but the Twins would get to Eagles starter Brandon LeBlanc for three runs in the top of the sixth to tie the game 5-5. In the bottom of the frame, the Eagles loaded the bases thanks to singles from Owen Luchies and Dexter Stoiber and Jacob Popadynec reaching on error. Dom Biello was then walked to score Luchies and give the Eagles back their lead. Ryan Whelan would then come in to close and he would need just 11 pitches, 10 of which were strikes, to keep the Twins off the board and close out the Eagles’ second win of the day. 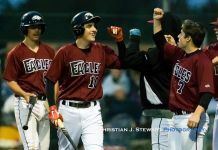 In addition to Burton’s home run, Biello would double and Luchies would add three hits to the Eagles 11-hit attack. LeBlanc gets the win going six full innings and giving up the five Twins runs on five hits, while striking out six and walking none. Ethan Skiffington takes the loss for the Twins.